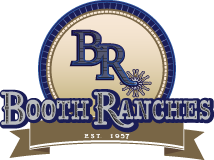 While Booth Ranches, LLC, is known internationally for their citrus, they also produce another premium product – performance Quarter Horses bred to excel in the sport of reining. Owner Loren Booth is a lifelong horsewoman who grew up riding all kinds of horses and now concentrates solely on reining. Her father, successful businessman Franklin ‘Otis’ Booth, Jr., taught her to narrow any business focus to concentrate on producing one great product. Booth chose to breed top reining horses and during the past decade has put together a treasured band of broodmares. 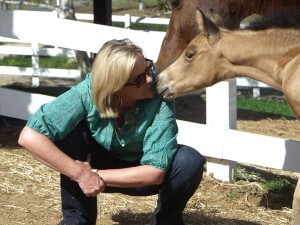 Mares and foals reside across rolling permanent pasture surrounded by Booth Ranches’ citrus groves in Orange Cove, California, an agricultural community in the foothills of the San Joaquin Valley. The classic foaling barn nestles into the landscape between the large pastures with the main residence overseeing from its nearby perch. In about 2009, Booth purchased 300 acres of pristine property in nearby Minkler along the Kings River. Her initial interest was in protecting the property from high-density development. She recently added a state-of-the-art training facility amid the sycamore and wild oak trees. Booth’s trainer, Tracer Gilson and his wife, Tricia, oversee all aged reining horses in the tranquil setting on 30 acres. Amenities include outdoor and large covered arenas, a 38-stall barn, additional pens and turnouts, a 6-horse exerciser and 60-foot round pen. Loren Booth loves the sport of reining and all that comes with it, including this 2012 filly by Smart Spook out of Alrighta Ida.